What OpenERP and Actions are Supported? New Product - Triggers when you add a new Product. You will need to have the ECommerce module installed. New Project Task - Triggers when you add a new Project Task. You will need to have the Project module installed. New Lead/Opportunity - Triggers when you add a new Lead/Opportunity. You will need to have the CRM module installed. New Database - Triggers when you add a new database. New Note - Triggers when you add a new Note. You will need to have the Note module installed. New Record - Triggers when a new record is added in a model (choose any model you have installed). New User - Triggers when you add a new User. You will need to have the Users module installed. New Module - Triggers when you add a new model. New Calendar Todo - Triggers when you add a new Calendar Todo. You will need to have the Calendar module installed. New Calendar Event - Triggers when you add a new Calendar Event. You will need to have the Calendar module installed. Create Project Task - Create a new Project Task. Create Lead/Opportunity - Create a new Lead/Opportunity. Create Record - Create a new record in a model of your choice. Create User - Create a new User. Create Calendar Todo - Create a new Calendar Todo. Create Calendar Event - Create a new Calendar Event. 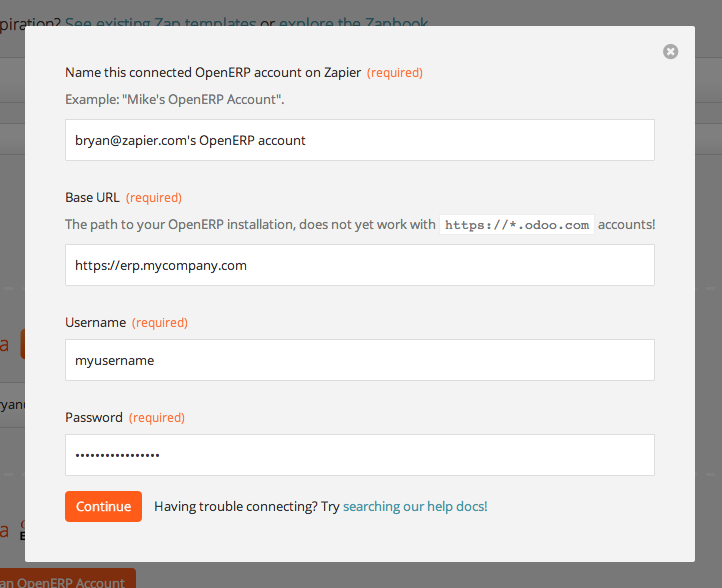 First thing you'll need to do is add an OpenERP to Zapier, you can do this in the course of creating a zap! But be sure to use https://erp.mycompany.com as your Base URL! Don't leave all that other stuff on it. Use the same username/password you use to login. You can also create a brand new Zapier only user if you need extra security! Your ERP instance must be available from the wider internet (not just from your company/enterprise intranet). We don't support https://mycompany.odoo.com accounts yet! Contact us if you have an account like that! After that, you should see the completed and successful test! Just continue setting up your zap!